Netflix launches shows that let you decide what happens next | What Hi-Fi? If you've ever wanted to direct your own Netflix show, now's your chance. The streaming service has introduced two shows that feature interactive storytelling - in other words you, the viewer, get to decide what happens next. You can't go wildly off-piste and, say, kill the main character (a shame, given certain lead actors we can think of) but you will be able to choose plot developments from a supplied list. The first shows with this feature are both aimed at kids and are spin-offs from existing Netflix favourites. 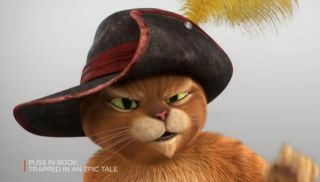 Puss In Book: Trapped In An Epic Tale is available to watch now, while Buddy Thunderstruck: The Maybe Pile is coming on 14th July. A third show with the feature, Stretch Armstrong: The Breakout, will land on Netflix next year. Netflix claims its web-based nature allows it to experiment with new storytelling tools such as this. "Content creators have the desire to tell non-linear stories like these, and Netflix provides the freedom to roam, try new things and let them do their best work," wrote Carla Engelbrecht Fisher, director of product innovation at Netflix, in a blog post. "Being an internet-based company enables us to innovate new formats, deliver at scale to millions of members all over the world on multiple device types and, most importantly, learn from it." The service claims it has carried out extensive research, speaking to children and parents alike about the feature. It says that kids' content was the natural place to start because children are eager to 'play' with their favourite characters, and are used to interacting with screens. "They also talk to their screens, as though the characters can hear them," Fisher goes on. "Now, that conversation can be two-way. "It's about finding the right stories - and storytellers - that can tell these complex narratives and bring them to life in a compelling way."